We’d love your help. Let us know what’s wrong with this preview of Louisa May Alcott by Susan Bailey. Fifty excerpts from the works of Louisa May Alcott are paired with passages from The Message, both serving as a new way in for personal and communal prayer. To ask other readers questions about Louisa May Alcott, please sign up. I love it when someone comes along, takes the writings of one of my favorite authors of old, and freshens things up and gives new life to words penned long ago. This is the case for the Literary Portals to Prayer series, but namely this book about Louisa May Alcott. Susan Bailey (author and blogger at Louisa May Alcott Is My Passion) knows and understand Louisa well, and was able to pick beautiful snippets from Miss Alcott's writings and pair them with meaningful verses along the same topics. I pe I love it when someone comes along, takes the writings of one of my favorite authors of old, and freshens things up and gives new life to words penned long ago. This is the case for the Literary Portals to Prayer series, but namely this book about Louisa May Alcott. I personally enjoyed this little book greatly, reading a few pages each day for some spiritual encouragement. Plus, it helped to whet my literary appetite when I got into reading snippets from some of Miss Alcott's writings that I've never read yet. It makes me want to read more from Louisa May Alcott! Religious notes: The scriptures used are taken from The Message: Catholic/Ecumenical Edition. Not being Catholic myself, I didn't really find any differences in what I believe and what was laid down as Biblical truth in this book. I recommend it for any Christian who is interested. The Message is so easy to understand, because it feels like it has (and it was) written in modern times, and so brings things out in verses differently than how I remember in other versions of the Bible. "...and led by her mother's hand, she had drawn nearer to the Friend who always welcomes every child with a love stronger than that of any father, tenderer than that of any mother." and you never, never quit. save your dear, dear child! This is a book that enables you to go as deep or as light as you like, depending on your brain and heart capacity at the time! This lovely collection of snippets from Louisa’s writings (about half are from Little Women) alongside verses from the Bible is light and portable, suitable for reflection in a variety of places and times. As its title suggests, Literary portals to prayer: Louisa May Alcott illuminated by the Message is designed to mark the beginning of what comes next. You can mull over This is a book that enables you to go as deep or as light as you like, depending on your brain and heart capacity at the time! This lovely collection of snippets from Louisa’s writings (about half are from Little Women) alongside verses from the Bible is light and portable, suitable for reflection in a variety of places and times. As its title suggests, Literary portals to prayer: Louisa May Alcott illuminated by the Message is designed to mark the beginning of what comes next. The Literary Portals to Prayer series has found the perfect guide through the work of Louisa May Alcott. Susan Bailey has compiled a remarkable edition of side by side texts from the beloved author of Little Women and corresponding passages from the Bible (source: The Message: The Bible in Contemporary Language by Eugene H. Peterson) in Illuminated By the Message. Through her selections, Ms. Bailey demonstrates a deep understanding of the life, world, and spirituality of Alcott (so amply also pr The Literary Portals to Prayer series has found the perfect guide through the work of Louisa May Alcott. Susan Bailey has compiled a remarkable edition of side by side texts from the beloved author of Little Women and corresponding passages from the Bible (source: The Message: The Bible in Contemporary Language by Eugene H. Peterson) in Illuminated By the Message. 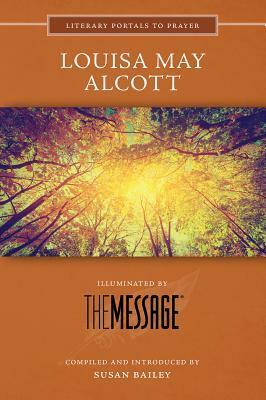 Through her selections, Ms. Bailey demonstrates a deep understanding of the life, world, and spirituality of Alcott (so amply also provided in her blog, Louisa May Alcott Is My Passion). As part of a famous feminist and transcendentalist family, who counted Thoreau and Emerson among her mentors, Louisa May Alcott was not a church-goer. But she had a deep and abiding relationship with her “Divine Friend” and how life should be lived in a meaningful and light-bearing way. Her expressions of gratitude, joy in nature, and perseverance through tribulations are matched with selections from Psalms, the gospels, and Pauline letters. Though my preference would have been for biblical translations closer to the more poetic Oxford versions, the matches are spot on and insightful. American manifestations of the divine take many glorious forms. Let Louisa and her wonderful 21st century friend guide you through hers. Susan Bailey has skillfully paired inspiring selections from a fairly representative scope of Louisa May Alcott's work with Biblical passages. This coupling of short passages brings renewed insight into the spiritual nature of Alcott's writing, as well as grounding Biblical lessons within resonate literary sketches, with a combined power to encourage, uplift, and sanctify everyday experience. I haven't read anything by Louisa May Alcott in years, but this little devotional has inspired me to go back and re-read some of my favorites as well as to seek some of her works that I wasn't aware of...and I'll read them in a new light. Thank you, Susan Bailey!